Celia is our resident artist. All of the kids enjoy art to some degree, but I've learned never to take her with me to the craft store...or else half the cart will be filled with paints and canvasses. Recently, she hasn't been able to attend her usual after school Art Club, so when she found we might have the opportunity to review Creating A Masterpiece, the begging commenced. 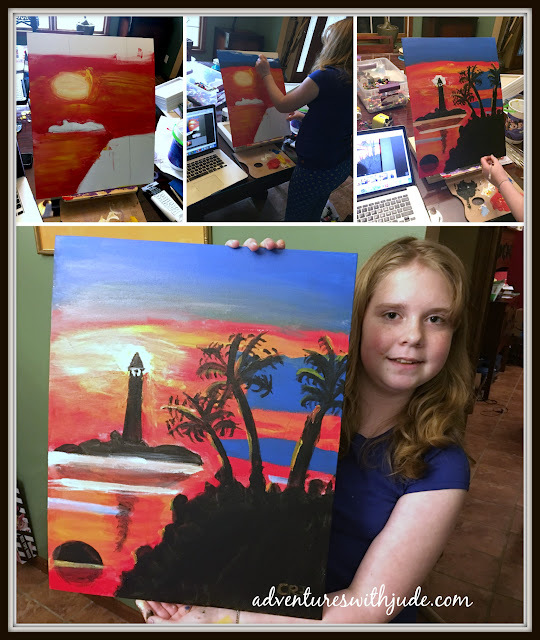 Lucky for her, we were chosen to receive a Monthly Plan membership, and our little artiste got to work. Creating a Masterpiece is produced by Sharon Hoefer, a master artist herself. After spending more than fifteen years as a studio teacher, she wanted to bring the ability to create art to a larger audience. She stressed technique over product, which I think a perfect way to instruct. She often repeats that it's not about copying the work she's producing but using it as a guide. This is a great philosophy. Many educational styles stress reading and/or copying passages of quality literature to come a good writer - the exposure helps a child what is worthy of emulation, but to develop his own style. I think often creating art gets caught up in "recreating the inspiration exactly" rather than allowing a vision to be shaped by the artist. We worked on the Caribbean Lighthouse (Level 1) acrylic work. Acrylic is Celia's favorite medium, so after clearing out her painting shelf, she thought she was ready to go right away. However, after checking the materials list, we realized that while she had the correct paints and brushes, she didn't have the proper size canvasses. For this work, Sharon recommends a larger 16" x 20" size, and we only had smaller 8" x 10" student canvases (not even the 11" x 14" smaller version she shows as the sample project). As I said, I've learned NOT to take her into the store if I want any semblance of keeping my budget intact, so Amazon it was! While she waited for the new canvases to arrive, she decided to see what would happen with a smaller one. She found that while it wasn't impossible, it did require some scaling, which she realized she wasn't really prepared for. It wasn't quite as nice as she had hoped it would be. Considering I struggle with drawing a straight line with a ruler, I thought it wasn't that bad. In the long run, it was actually kind of good for her to create a "practice" work, because when she got her hands on the larger one, she was ready to work in a new-to-her scale. She also had worked out some of the kinks with the lessons. Lessons are about an hour each, between instruction and activity. Beginner level projects are one lesson per work, while Levels One through Five average three to four per piece. For the Caribbean Sunset, the four lessons were fairly short - two were 15 minutes each, and two were half an hour of video time. Painting time varied, but the stumbling block for Celia was drying time. When she did her smaller painting, it took her a few weeks to complete the project. On the one hand, this wasn't a big deal -- the paint had time to dry between lessons, and she fit the lessons in when she didn't have other work. (Since she's in private school instead of homeschooled, she has homework and other projects that take up most of her evenings.) However, she decided to work the larger canvas on a Saturday afternoon. Having completed the lessons, adding up the time to watch and paint, she estimated she'd need about two hours to finish. I feel like we needed those little cards they hold up in SpongeBob episodes that say "Six...hours...later..."
She finally finished after dinner, because she had to keep waiting on drying paint. I think she was lulled into a false sense of speed because much of the work on this piece can be done with paint still wet. You can see there are many blurred edges, which lend both depth and reality to the work. However, as she learned, it's not a good idea to try to paint a firm black edge into wet yellow/white paint. I would definitely plan to factor in drying time with any of the painted works. There is a "Helpful Hints" section with each lesson; she wishes it had given her a heads up on spots where she should have planned on taking a break. I can see her point because while younger students might need more supervision and more frequent breaks, an older student could definitely spend an afternoon working alone and just get caught up in the rhythm. The other thing Celia told me was there was never any mention of prepping the canvas. 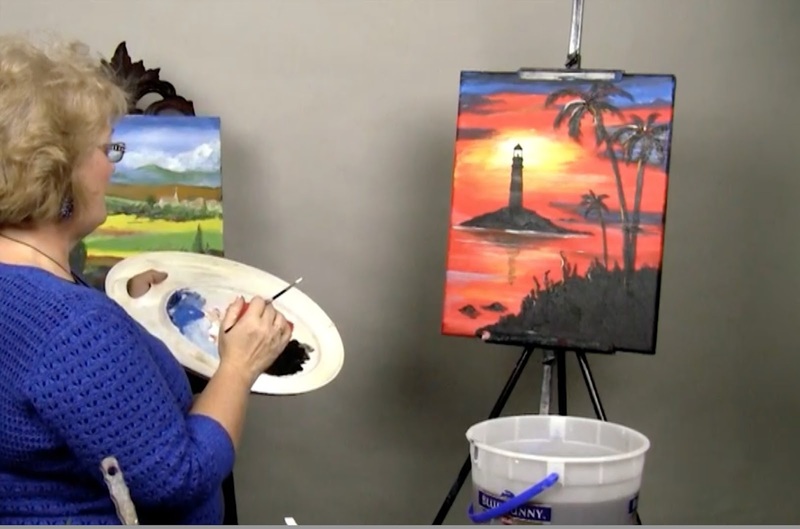 Sharon talks about what types of paints to use, but never about any priming. According to Celia (and since she's almost thirteen with four years of Art Club membership, I'll consider her the leading expert - ha ha), you can say "primer" and artists will know what you're talking about, but saying "Gesso your canvas" is the same as saying "Xerox this paper," or "Hand me a Kleenex, please." Gesso is a brand of primer, but it's also become a synonym for "prep your canvas with a primer." The first video spends a long time discussing paints, brushes, having an easel, etc., but never mentions "Make sure your canvas is primed." 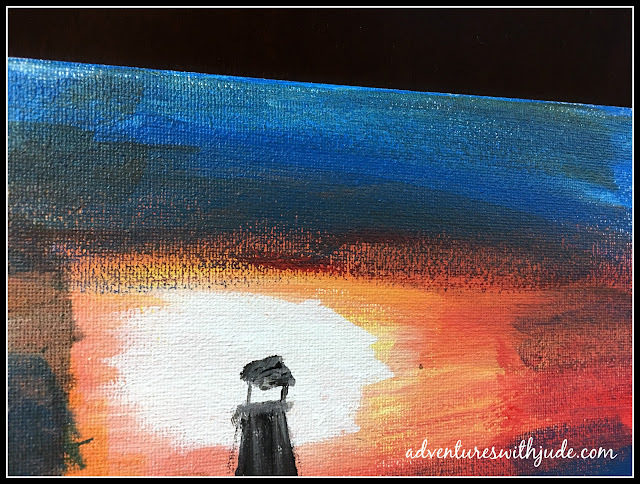 She has found that while most student-level canvases are primed, not all are, or they're not primed well (especially if they're less expensive). 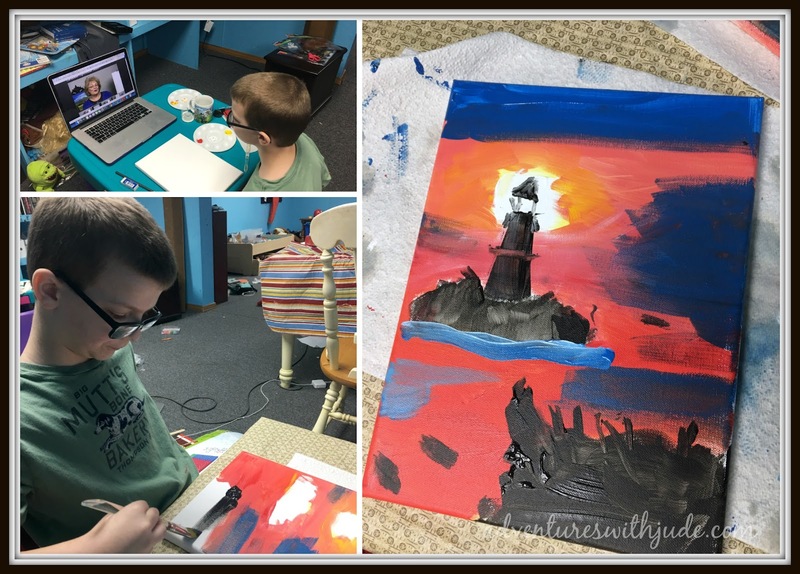 When Jude and I tried working on this piece, I struggled with getting the paint to cover smoothly. I asked Celia what was I doing wrong, and she said (in a tone that only a tween self-appointed expert can deliver), "Clearly, you didn't Gesso first." I could only laugh -- because she was right. I didn't prime my canvas. In my defense, she picked out the canvases on our last art supply binge, and I remember her saying, "Oh, good, these say pre-primed!" I admit I wasn't sure what it meant, other than she put back the large bottle and swapped it for a smaller one -- apparently she figured she could get away with a smaller bottle of Gesso for "just in case" rather than a massive "I know I need to prime all of this" sized bottle. 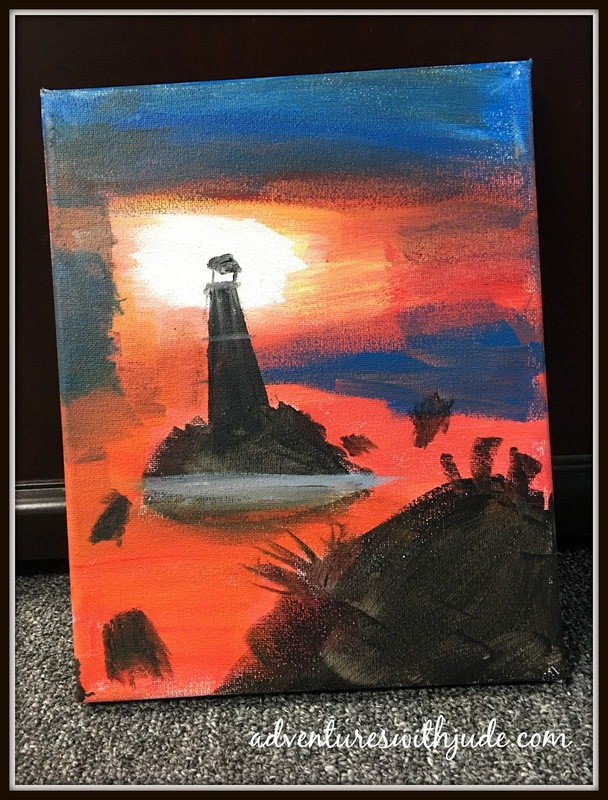 Apparently, that particular package of canvases wasn't well-primed (she found out the hard way she should have just gotten the larger bottle after all), and as a total newbie, I didn't know that it didn't "feel right" to the touch. She showed me the difference between those and the one she primed herself: a well-primed canvas will be much smoother than one that isn't, kind of like the difference between a piece of new drywall and one that's had a coat or two of primer to seal it. That batch still felt rough. If you start to paint, it should apply evenly. You can see where mine still has a lot of texture, and the paint didn't blend well. Lesson learned. But she then realized that if she didn't already know what it was supposed to feel like, somebody (like Mom!) could buy a canvas that wasn't truly ready for painting and think they did a bad job. She thinks there should be "Before You Get Started" video with the Acrylics, or even a link on the supplies page that addresses properly priming canvases. So, how did my "poorly gessoed work" come out? Actually -- I was rather surprised how good it was! I don't think it was bad, in this case -- because the uneven paint added a bit of dimension to the picture. However, it would definitely not have worked as an "Oh, yeah, I meant to do that, ha ha ha!" with the darker and more stylized Van Gogh-esqe painting. I don't think I'm ready to paint for the Royal Academy, and it's not going to hang in the Louvre, but for a person who has to stretch to draw a stick man, I think it's pretty good. In this lesson, Sharon focuses on the Rule of Three, focal point, and allowing yourself to say "I feel like putting this here...I think there should be more red there..."
What I wanted to see was how well a student with no experience could do, or a student like me who has no innate painting and drawing skills. (When I had to do a semester of set building in college, I begged the shop director to let me just build and not do finish work beyond "coat with primer.") I was impressed that we could actually follow along and have a picture that looked like the sample! You can see that while we each have used the same inspiration, there are clearly individual takes on it. I haven't decided if I'm going to go back and add the palm trees or not...I rather like the open space. 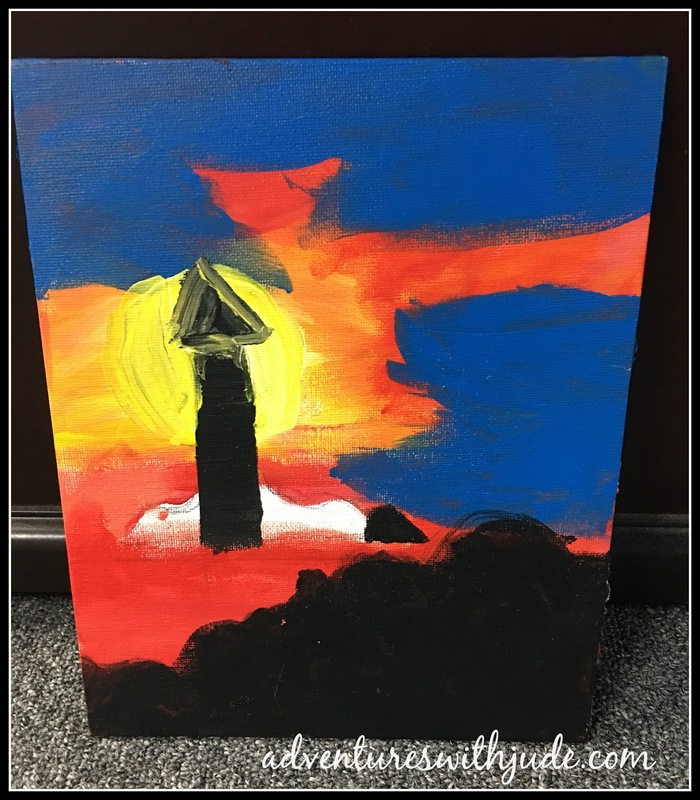 Jude also gave this painting a go. He didn't enjoy the program as much, but he isn't exactly a fan of painting and drawing. However, with a little help, his painting looks a lot like the original. Sharon asked us to share this picture of one of her students with readers, to show that a student of any age can create a masterpiece. Celia and I are looking forward to doing more projects. We are considering the "Spring Flowers" for next. (And yes, I'll be sure to check if my canvas is primed or not!) To read more reviews (and see more masterpieces), click the banner below! 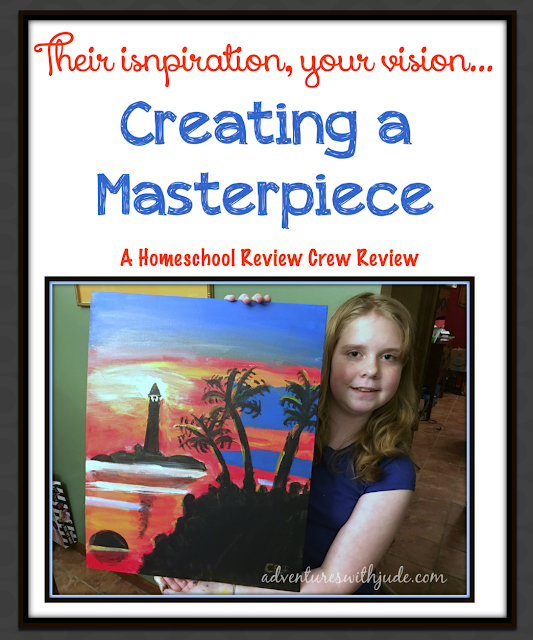 If you'd like to try a lesson on your own, Create a Masterpiece offers a free sample lesson.